Apple Inc’s highly anticipated iPhone X features a slew of innovations but delayed availability could hurt holiday-quarter sales. 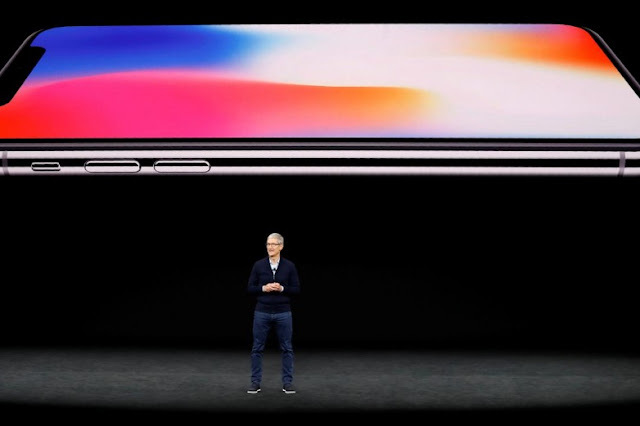 The much-hyped event on Tuesday unveiled three new phones, an advanced watch that can take calls and a new Apple TV, but die-hard fans will not be able to get their hands on the iPhone X until Nov. 3 - much later than iPhone 8’s shipping date of Sept. 22. The delay in shipping of the iPhone X could hurt Apple’s seasonally-strong fiscal first quarter as orders get pushed to the following quarter. The phone will start at $999 for the 64 GB version. Apple’s shares were down 1 percent at $159.35 in early trading on Wednesday. Although decked out with facial recognition technology, front and back glass, a 5.8-inch edge to edge display, wireless charging and animated emojis, some analysts said the delay tempers near-term sales and a few adjusted their estimates. “Given one month less sales for the iPhone X during the December quarter, we have reduced our December quarter iPhone sales estimates from 84 million to 79 million units,” Canaccord Genuity analysts wrote in a client note. The company’s iPhone 8 and 8 Plus did not veer far away from previous models, sporting modest new features such as a glass body, wireless charging, better camera and a faster processor. This could lead consumers to wait for the iPhone X. “None of the features in the version 8 product will likely accelerate demand,” Mizuho analysts wrote in a note. Apple typically launches new iPhones in September and a big jump in sales usually follows in the holiday quarter, as users tend to upgrade devices when new phones sport significant design changes. Apple last saw a significant uptick in sales with the introduction of iPhone 6 in 2015. While the delay of the iPhone X could hurt near-term sales, analysts still think Apple’s loyal and hungry fans would lap up the new phone, boosting sales for fiscal 2018. Brokerage UBS said it continues to estimate 246 million phones in fiscal 2018 – up 15 percent. Apple, which is trying to energize sales in China, could hit a wall selling the pricey new phones there. The 8 and 8 plus start at $699 and the iPhone X is Apple’s most expensive phone. The high price of the iPhone X may not affect sales in the United States, where telecom carriers subsidize phone ownership, but it might dent sales in China and India. But even with the lack of major surprises, Apple’s phones are still expected to sell well. “It will still sell in enormous volumes because Apple has repeatedly demonstrated its ability to persuade consumers to shift their overall spending to place a greater share of their disposable income toward a smartphone purchase,” IHS Markit analyst wrote in a note.